Exposure to osteopathy in the cranial field (OCF) usually begins with the regular OMM curriculum during the pre-clinical years in medical school. The Student American Academy of Osteopathy (SAAO) chapter at each school may offer workshops and other opportunities to develop skills in OCF. 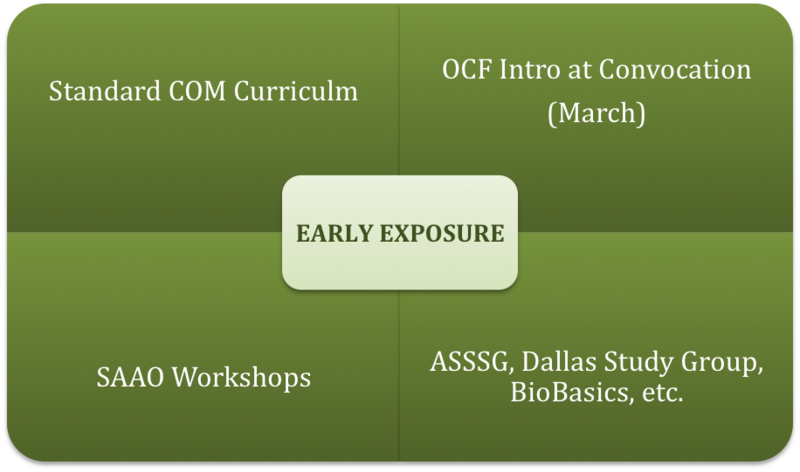 Additional exposure to OCF may come at the AAO Convocation in March each year. The Osteopathic Cranial Academy (OCA) sponsors a yearly introductory workshop, with many of our regular faculty present to table train and help students with their palpatory experience of OCF. The Physician-In-Training Advisor to the Board is a liaison between the OCA and the SAAO/NUFA/PAAO, and encourages participation in the OCA by officers and members of these organizations. In-depth training in OCF starts with 40-hour Introductory Courses. 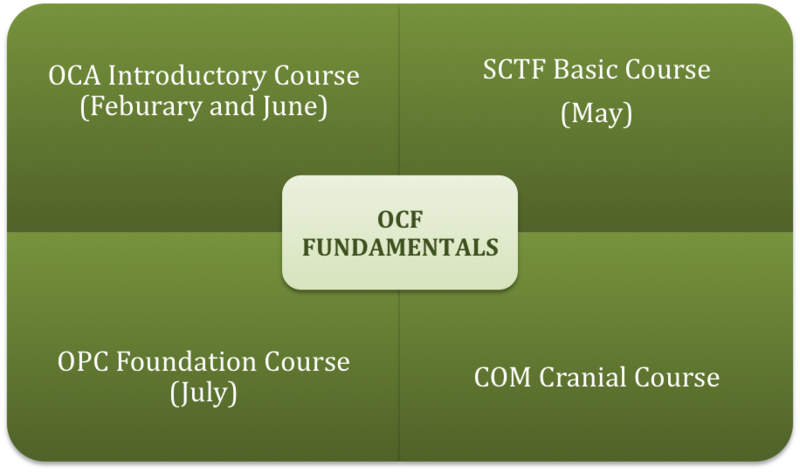 The intense curriculum demands that serious students attend multiple introductory courses to begin to master the fundamentals of OCF. Different organizations have different names for these courses. See our CME page for schedules. The Osteopathic Cranial Academy sponsors two Introductory Courses annually (one in February and one in June). Half-tuition scholarships for osteopathic medical students are available, applications are due Oct 1 for the February class, and Mar 1 for the June class. The Sutherland Cranial Teaching Foundation (SCTF) presents a Basic Course in the late spring/early summer. The SCTF does not recognize COM courses, and requires that one of the two fundamental courses be their basic course in order to take their higher level courses. The Promise/Osteopathic Center for Children puts on a Foundation Course each July in San Diego. Intermediate courses typically require two prior fundamental (Basic, Intro, etc.) courses. Some colleges of osteopathic medicine (COMs) host an introductory course based on the curriculum and standards of the OCA. Recent COM classes include Kirksville, Western, Des Moines, Rocky Vista, Touro-CA, Ohio U COM. These courses are for students only and may qualify for one of the two courses required for further study. If you are interested in starting one at your school, see here. After a student takes an approved class, he or she is eligible for OCA membership and able to attend the OCA Annual Conference in June. Student scholarships are also available for the Annual Conference — one per school, chosen by the school’s SAAO Advisor. After an approved introductory course, students can take The Next Step, a core intermediate level course. 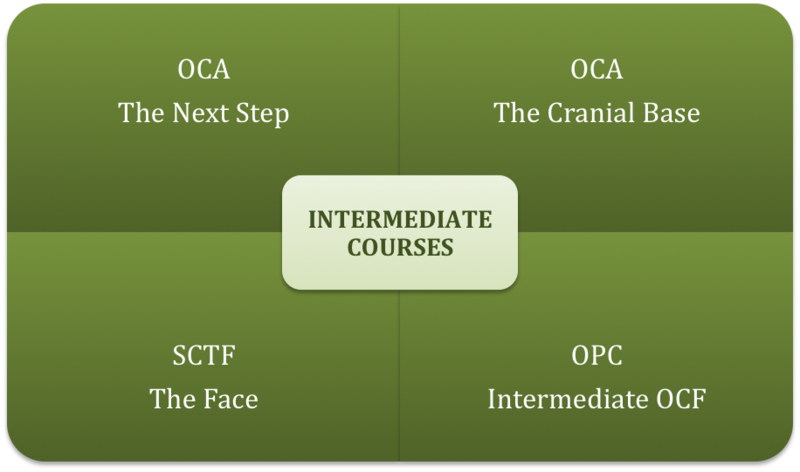 After two introductory classes, students are eligible to take further courses, including the two other OCA core intermediate courses (The Cranial Base and Pediatrics) that are offered on a rotating basis as well as advanced level courses. In addition to our website, courses are announced on the OCA Facebook Page. 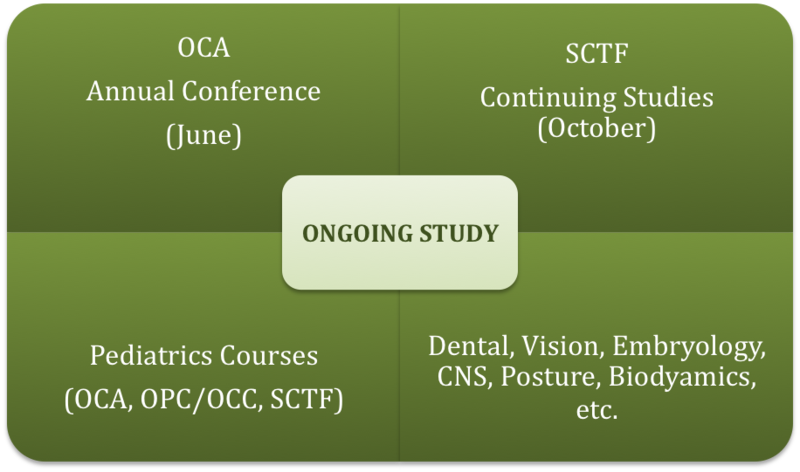 The SCTF offers a Face course periodically and the OPC offers other intermediate courses as well. Students are encouraged to do elective rotations during the 3rd/4th year of medical school with physicians who practice osteopathy in the cranial field. Undergraduate teaching fellowships in OMM are available at some schools and can often be quite competitive. This involves an extra year of school working as a teaching assistant and in clinic, often with faculty who practice osteopathy in the cranial field. Residency options for training in OCF include NMM/OMM residencies, Plus-One Fellowships and combined four year programs. Many residencies with osteopathic recognition in other specialties (family practice, internal medicine, neurology, etc.) also offer opportunities to practice OCF and other osteopathic approaches. Many conventional ACGME residencies that offer Integrative Medicine Fellowships are supportive of residents developing their OMM skills. Networking at the AAO Convocation can help students find programs that are a good fit. Once in practice, physicians further refine their skills by attending intermediate and advanced courses in OCF, attending the OCA annual conference and later by table training and teaching. In addition, many areas have study groups for physicians in practice. OCF requires lifelong study of anatomy and physiology as well as the ongoing refinement of palpatory skills. Many OMM courses are open to students. See the list of CME courses under the For Physicians page.